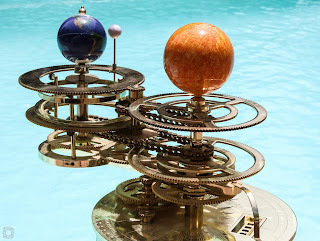 An orrery is an astronomical model, not to scale, showing the relative movements of solar system bodies. This, a motorised representation of the relative motions of the sun, earth and moon, is a specialized orrery, called a tellurion. I made this from a brass kit about ten years ago - the kit distributer was Eaglemoss, but they have removed information about the machine from their published material. I have had a couple of questions since I first published this. The power source supplied by Eaglemoss was a 6 volt 500ma. This should give you a standard rotation time of about 12 minutes. 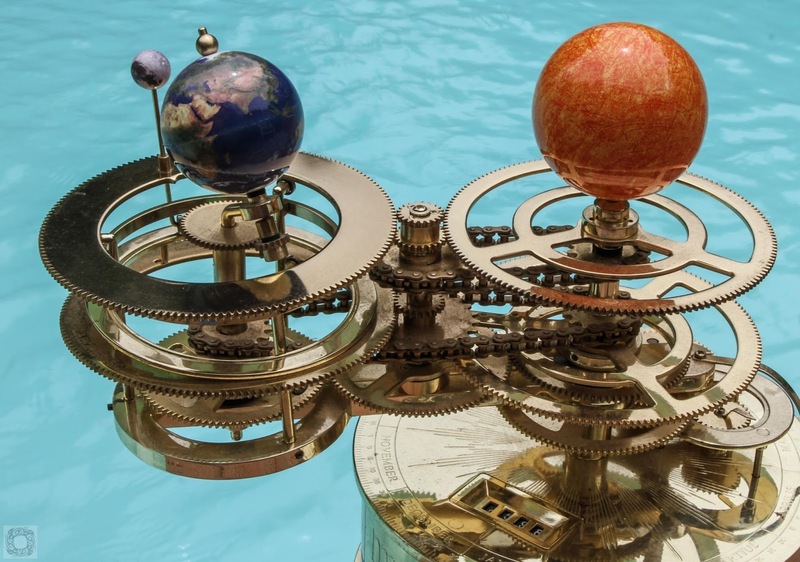 Other builders report that they swapped the power with the earlier Eaglemoss Orrery without issue, but a dedicated power source would be less hassle. I had problems with getting this to rotate. Small differences in manufacture and the lacquer used seem to be to blame, creating a range of points at which the gears can become stuck. Small issues can be overcome by the right lubricant or small brass washers but if you have tight point, the fix is a fairly painstaking process of testing the rotation of each gear and working out how to fix the issue (I had to shim some parts and have a couple of very thin washers to lift gears into a sweet spot - each machine is slightly different, and will require slightly different treatments). Just because the machine will do a two hundred rotations this is no guarantee it will complete 300 - because the tight point might not become obvious until rotation 250 (2,500 minutes into the process). There is a comprehensive private support forum (extending to 60+ pages) that might help you through the process - http://www.skyatnightmagazine.com/forum/part-work-earth-moon-and-sun-orbiter-t90740.html - there is a bit of negativity on the site, but it is clear that if you persevere it will eventually operate like clock-work. After a couple of years of getting it to work, I still love the machine - the bass is awesome - although the seam on the Earth has always been a sore point. This is one that really needs to be kept out of reach of dust* perhaps in a purpose made low cabinet with glass surrounds.